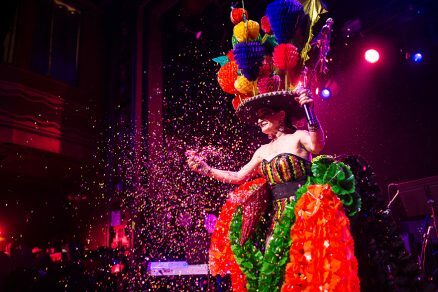 Celebrate Cinco de Mayo with Mexican cabaret artist Astrid Hadad’s Tierra Misteriosa, a sassy and tuneful jaunt through Mexico’s tumultuous history. Carried by slaves, Astrid takes us from the ancient Mexico of Tenochtitlan, through the forgotten women of history like Malinche, the beautiful woman who acted as Cortes’ interpreter and later bore his children, to the Mexican heroine of the future. Part telenovela, part vaudeville and concert, Hadad shimmies in gorgeous, over the top costumes and soulfully sings us through the historical contradictions of her beloved homeland. We’ll hear some of the great Mexican Banda classics and some of Astrid’s own pungent music. The colors are rich, the music is hot and the drama is real, but it is Astrid’s insightful and irreverent commentaries that really provide the oxygen.